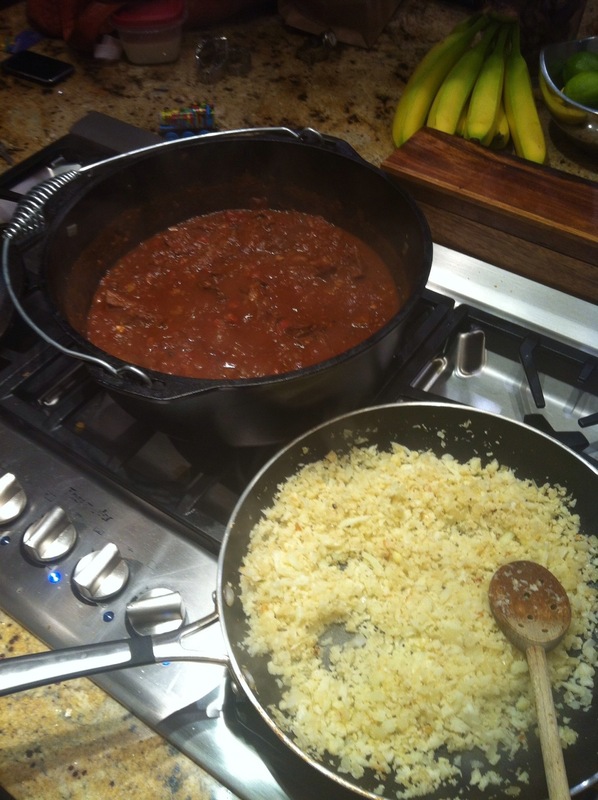 So tonight’s dinner was Chili with Cauliflower “Rice”. The chili was pretty darn good as it used stew meat as a base so the chunks of meat were big and tasty. It used chipotle chile powder and plenty of cumin, so it was really smokey. Topped it off with cubed avocado and it was a hit. I think the recipe is from Make it Paleo. It has to stew for 4-5 hours, so it’s not a quick meal by any means, but worth the time if you have it. Truthfully, I’m of the school that chili doesn’t have beans anyway, so making this paleo version of chili was easy for me. The beans just take away from the flavor of the beef and chile peppers if you ask me! How do you do the “rice” cauliflower? I see two ways to do it. You can use a box grater and grate it. That leads to blood normally for me though! I just pulse it in the food processor till I like the consistency. I sauté onions and garlic a bit, then add the cauliflower. I like adding curry powder to make it interesting. Pretty good!